The Lisburn sprinter set a personal best in Athlone on Sunday. Kelly Proper in action in the long jump. 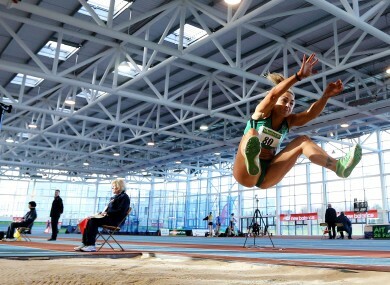 AMY FOSTER RAN a personal best of 7.32 to claim the women’s 60m title at the Woodie’s DIY National Senior Indoor Track and Field Championships at the AIT International Arena, Athlone on Sunday, a time which also ensures qualification for the World Indoor Track and Field Championships which take place in Sopot, Poland next March. The Lisburn athlete was joined on the top step of the podium by Kelly Proper who added the 200m title to her long jump crown from Saturday, setting a new personal best and stadium record of 23.56. Marcus Lawler was the other stand-out performance of the weekend, recording a new junior record of 21.19 to take the senior men’s 200m. Email “Slideshow: Foster qualifies for World Indoors at action-packed National Championships”. Feedback on “Slideshow: Foster qualifies for World Indoors at action-packed National Championships”.